What are we to do with the unnecessary, deadly remnants of our Cold War belligerence? The US and Russia have approximately 7000 warheads each, enough to destroy humanity many times over. The US has enough highly radioactive plutonium, left over from the Cold War and generated by its nuclear power plants, to produce 10,000 more warheads. What are we to do with this unnecessary, deadly remnant of our belligerence? There are “two kinds of problems, the urgent and the important", as President Dwight Eisenhower said in his 1954 speech at Northwestern University. "The urgent are not important, and the important are never urgent." Plutonium waste is not on the urgent pile of world leaders’ agendas. But it’s top of the important pile for humanity. We are already failing our future generations. In February 2014, an explosion shook the main plutonium storage facility near Carlsbad, New Mexico, resulting in extensive damage. Its cause was an innocent typo and poor oversight, according to Patrick Malone of the journal New Mexican. Absorbent clay is used to neutralize potential acidic chemical reactions from diverse neutralizing compounds in the waste drums. Probably to cut costs, relying on cat litter as a source of clay was recommended. But a slight typo in an update memo changed the specifications from "kitty litter/zeolite clay" to simply "kitty litter (clay)", as the official report noted. The result was the use of a highly reactive organic wheat-based cat litter (sWheat Scoop brand), instead of an inorganic clay-based litter, to stabilize the drum mixture. This led to a slow but relentless chemical reaction inside the drum, causing it to overheat and finally explode. The cost of repair and delays was estimated at $1.4 billion. In May 2017, a storage tunnel collapsed at the Hanford nuclear waste storage facility in Washington state. Maintenance was at fault, not only of the infrastructure but of the waste drums themselves. Leakages of highly radioactive waste have happened before in that facility, according to The Atlantic. On the Department of Energy’s website, it announces the removal of “radioactive sludge stored near the Columbia River”, where “near” means “about 400 yards” (360 metres) from the river. There are 53 million gallons of such radioactive sludge stored at Hanford, with no clear measure of the current level of leakage so close to a precious water resource. Such contamination has already taken place, for example in Coldwater Creek, north of Saint Louis, Missouri. A report published in June 2018 by the US Department of Health and Human Services concluded: "children and adults who regularly played in or around Coldwater Creek or lived in its floodplain for many years in the past (1960s to 1990s) may have been exposed to radiological contaminants. ATSDR estimated that this exposure could increase the risk of developing bone or lung cancer, leukemia, or (to a lesser extent) skin or breast cancer." Coldwater Creek does not have near the level of radiation of Chernobyl or Fukushima, but its contamination was more insidious because there was no warning to residents, who unknowingly played around radioactive shores. Nuclear waste is a global problem. France, one of the countries most reliant on nuclear power, still has no long-term storage plan in place. In the meantime, it generates 2kg of radioactive waste per person annually, a small but not insignificant part of which will remain dangerous for at least 200,000 years. The oldest known illustrative cave paintings are only 40,000 years old. The first writing system appeared 10,000 years ago. It’s impossible, if not recklessly hubristic, to make any plan on a timescale of 100,000 years. What are we to make of similar radioactive waste storage predicaments in Russia, Japan, China, Ukraine, or any of the more than 30 nations relying on nuclear power? Such waste must be secured for a minimum of 300 years, some of it for hundreds of thousand of years. But after only a few decades, our institutions are already showing signs of fatigue. Vitrification, a method of encasing waste in glass to make it leakproof, is the consensus proposal to remedy leakage issues. But such an irreversible process will forever limit access to the waste, thereby nullifying any future remediation solution. Intense radioactivity will still be toxic through the glass. Vitrification is a solution steeped in our limited scientific knowledge that will burden humanity with man-made radioactivity longer than any of our institutions, or even forms of government, can reasonably be expected to last. Giving us hope, a team of current and former CERN scientists in Geneva, among them Nobel Prize winner Carlo Rubbia, suggest a different approach. They simulated and partially tested a system to transform highly radioactive waste lasting hundreds of thousands of years into mildly radioactive waste with less than 300 years of toxicity, a more manageable time frame. Relying on a proton beam, which is common technology at CERN, and a little-used natural element called thorium, which is almost as common as lead, they propose to neutralize the world’s highly radioactive waste in as little as a few decades. They call their detailed design the "Accelerator Driven System" (ADS), and they have partnerships in place to prove its efficacy. The estimated budget to take it from computer modelling to actual demonstration within five years is $70 million. But while the Bechtel corporation is starting construction on a $17 billion vitrification plant, the CERN team of eminent scientists have yet to receive any significant funding. A corollary of the radioactive waste neutralization reaction could be CO2-free electrical energy, if coupled with a heat exchanger. Sometimes, as Steve Jobs marvelled, the right technology is generous and feels magical. 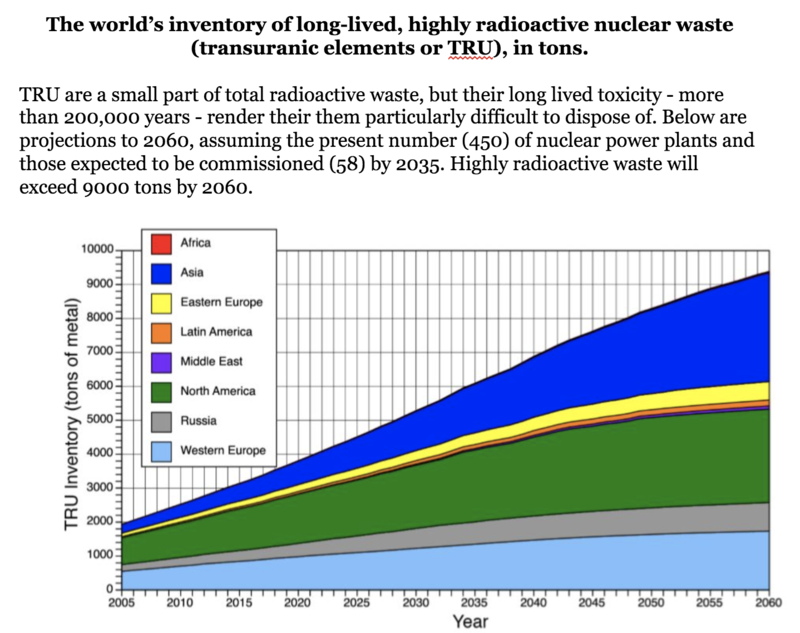 Wouldn’t it be fair to our great-great-great-grandchildren to try a new approach to radioactive waste management? We have already failed our oceans from a lack of political will to face plastic pollution. Let’s not risk allowing our entire planet to face a similar fate from radioactive waste. What are the whereabouts of the world's nuclear weapons?